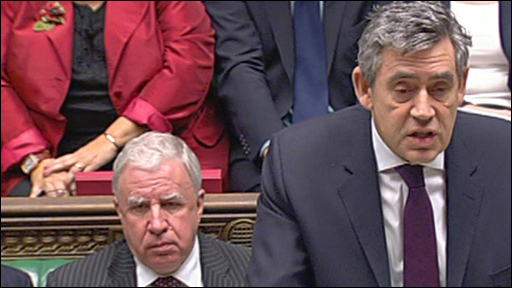 Britain's economic downturn is likely to cause a recession, Prime Minister Gordon Brown has warned. The global financial slowdown was likely to send the British economy into a recession as well, he told MPs during weekly questioning in Parliament. Mr Brown has echoed similar warnings from the Bank of England governor, Mervyn King, and a key think tank. Economic worries have sent the pound plunging to a five-year low against the US dollar. Mr Brown told MPs: ""Having taken action on the banking system, we must now take action on the global financial recession." He said this was likely to cause "recession in America, France, Italy, Germany, Japan and - because no country can insulate itself from it - Britain too". Mr Brown is now due to attend a global summit in the US next month to discuss continuing ways to tackle the financial crisis. Conservative Party leader David Cameron said the prime minister must shoulder some blame for Britain's downturn. "He claimed the credit in the boom, why won't he take responsibility in the bust?" Mr Cameron said. On Tuesday evening, Mr King warned that Britain was probably entering its first recession in 16 years. The Bank of England has also been criticised for being too slow to cut interest rates in response to the UK's worsening economic situation. Sushil Wadhwani, a former member of the Bank of England's monetary policy committee, told the BBC: "The committee has been too slow to acknowledge the risks of a recession and they have fallen behind the curve. Meanwhile, the National Institute of Economic and Social Research has said the UK is on the brink of its first full year of recession since 1991. In a speech to business leaders in Leeds on Tuesday night, the Bank of England governor said he was concerned about rising unemployment and falling house prices. But Mr King did try to inject a note of optimism, saying that the government's rescue package would now lead to a slow resumption of normal lending.